Hunting in the wild was an essential skill for survival during prehistoric times. Interestingly, this skill has made its way into the modern times, not as a form of survival or getting nutrition but as a mere hobby for some people. With the advancement of technology, humans have developed more efficient ways of agriculture and farming domesticated livestock to supply their diet. There have also been many changes in the way human beings hunt. In the past, hunting was solely done on foot; traversing forests for an entire day while carrying primitive tools such as spears and sharpened rocks. Now, more advanced tools such as hunting gears, airsoft guns, and high-resolution binoculars are readily available to us. Additionally, hunting can now be done in a stationary position while waiting for the target to get in the line of sight. Climbing tree stands exactly does that. It helps you focus on a target on a strategic elevated position that you choose. But just like any other products out there, not all climbing tree stands are created equal. So here are five things that you should look for when shopping for the best climbing tree stand for you. Durability, among all other factors, must be looked into to serve the product’s purpose. The material is very important especially since climbing tree stands would need to support the weight of a person with his or her hunting tools high above the ground. High-quality stainless steel is the best material for tree stands. It is extremely resistant to breakage and corrosion caused by moisture and precipitation. Since tree stands are made to keep a hunter in a stable position during a lookout, comfort would consequently play a key role in keeping the hunter in focus. 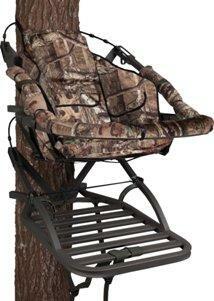 Good tree stands are equipped with padded seats to provide maximum comfort during a long hunt. It also protects the user from sustaining pains and injuries usually in the back and the pelvic areas that they may be obtained from long hours of sitting and waiting. Harnesses for the whole body should also be one of the top priorities that should be considered when buying a climbing tree stand. While on a tree stand, anything can happen. You can slide off the seat, fall from it, and get hurt. Look for tree stands with whole body harnesses made from good quality material to ensure your safety during a hunt. Good tree stands are made from lightweight materials that make easy to transport and to set up on a tree. Such materials include aluminum for the frame, high-quality foam for the seat, and durable fabric for harnesses. These will not only provide ease of transport but also safety against injuries. That is why you should always take the material into consideration. Lastly, consider the costs of buying and maintaining a climbing tree stand. Climbing tree stands range from very cheap to highly expensive ones depending on the materials. Find out what best suits your preferences and choose an ideal product that matches your budget. Go for a brand that would provide the most value in terms of durability, comfort, and safety rather than just opting for the cheapest one.